In order to ensure that our patients have ample time with our doctors, we operate primarily by appointment. However, emergency cases will receive priority which may cause a delay in appointments times. In any case, we do make every effort to see each client on time. If you need to change or cancel your appointment, please call us at (559) 686-8544. We request the courtesy of at least 48 hours’ notice for cancellations so that we may schedule another patient in your place. For your protection, as well as others, we require that all dogs be on a leash and properly controlled while in the waiting or exam rooms. All cats must be in an appropriate cat carrier or on a leash. If you find yourself without a leash, please help yourself to our complimentary ones hanging in our waiting room. There are many colors to choose from! We require full payment at the time that services are rendered. For your convenience, we accept cash, personal checks, Visa, MasterCard, Care Credit, and Sunbit. Products that have left our facility cannot be returned. However, according to manufacturer guarantee, opened bags of dog and cat food may be returned or exchanged. 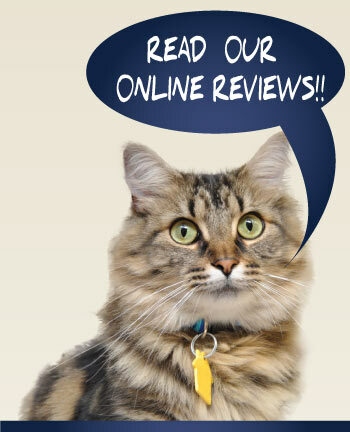 We are pleased to refill your pet’s prescription through our online pharmacy. Please give us as much notice as possible when refills are needed. We do not recommend purchasing your pet’s medications from unknown online pharmacies. Please talk with us first before purchasing your pet’s medications from another source. You will find our in-house pharmacy prices are very competitive. 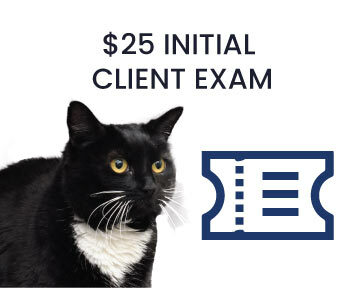 Please be aware that you pet is required by law to be examined at least once in the past year to continue to refill medications. For the safety of all animals in our care, as well as our staff, we require that all vaccinations be current. In order to keep our facility flea free, we require that all hospitalized animals be flea free as well. We will treat your animal at your expense if any fleas are noticed on your pet at time of hospitalization. We recommend spaying or neutering every pet, and we recommend spaying or neutering your non-breeding pet around six months. This recommendation may vary based on each individual pet. Please schedule an appointment to discuss spaying or neutering your pet with one of our veterinarians. The first rabies shot your pet receives is good for one year. Subsequent canine rabies vaccinations immunize your pet for one to three years depending upon the vaccine your pet receives. Both dogs and cats are required by state law to be vaccinated against rabies. For cats, we use feline-exclusive rabies vaccines which are good for one year. What is heartworm protection and how many months should my pet be on heartworm prevention medication? Heartworm disease is a serious disease transmitted by infected mosquitoes and, if left untreated can be fatal. Heartworm prevention is administered once a month either by pill or by topical application. Depending on the specific product you and your veterinarian choose for your pet, heartworm prevention medication can prevent other parasite infestations including internal parasites (worms) and external parasites (fleas and ticks). In accordance with the guidelines of the American Heartworm Society, we recommend all dogs and cats be given year round (12 months) heartworm prevention regardless of lifestyle. My pet never goes outside so does it really need heartworm prevention? Yes. Heartworm disease is transmitted through the bite of a mosquito and all mosquitoes can get into houses. It is important to prevent fleas. We recommend all dogs and cats be given a monthly flea preventive regardless of lifestyle from April through December. Not only are they uncomfortable for your pet, fleas are also carriers of disease, such as tapeworms. There are many medications for the treatment and prevention of fleas. Some medications are in a combined form with the monthly heartworm medication. Not only is this convenient, but it reduces the cost of two medications! Many of the pets that visit us on a regular basis need professional teeth cleaning. When bacteria irritate the gum line, the gums become inflamed in the early stages of dental disease causing gingivitis. Left untreated, this leads to periodontal disease which causes the loss of the bone and gingival support structure of the tooth and subsequent tooth loss. In addition, the bacteria are consistently released into the blood stream allowing for systemic infections, which can cause damage to internal organs, such as the kidneys, liver and heart. A dental exam is a part of any physical exam at Tulare Veterinary Hospital. Yes. Proper dental care at home is highly recommended to help maintain the oral health of your dog and cat. Home dental care for companion animals should start early, even before the adult teeth erupt. It is best if owners brush their dogs and cats teeth frequently. Although tooth brushing is the best method of preventing plaque, calculus, and bacterial build-up, there are many options for dental home care. Other oral home care options such as dental formulated foods, water additives, and dental treats can be considered and discussed with one of our veterinarians.